A smartwatch is a mobile device; it consists of a package, including the computer and the display, attached to a bracelet. Different models have different features, such as time display, voice calls, pedometer, GPS, heart pulse, music player etc. Some models, also called ‘watch phones’ (or vice versa), may have complete functionality of a typical smartphone. Yes, MyFrap! supports kids smartwatches like Q50, Q60, Q90, Q100, Q360, Q527, Q528, Q750, DF25, GW900 and similar. Yes, smartwatch needs active SIM card to communicate with MyFrap! network. SIM card must allow GSM data transfer. PIN must be disabled. I own smartwatch, what’s next? Insert the SIM card into the watch. Depending on the model, the SIM card is inserted into the side slot or under the battery inside the device. In second case, we recommend installing the SIM card by an experienced person (watchmaker, GSM service point or a person experienced with Li-polymer batteries, commonly referred to as LiPo). After restarting the watch, it’s ready to be registered in the MyFrap! 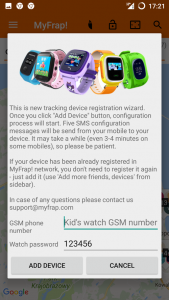 How to register smartwatch in MyFrap! network? If you have made sure that the Internet is available when a SIM-card is in the phone, and the watch still does not run, you may need to set the correct APN. Usually, GSM operators provide APN settings automatically, but not for all SIM-cards. Please contact your GSM operator to provide you apnname, login and password. May I invite my friends who don’t own smartwatches? Yes, MyFrap! 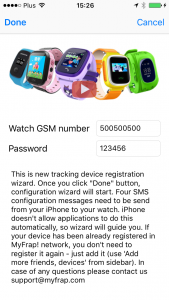 allows to localize devices like smartwatches as well other friends and family members who installed MyFrap! on their smartphones. To add their to your map, use “Invite family and friends” dialog from the sidebar. I signed in via Google+, but I don’t my friends? MyFrap! network connects people by their email addresses. Make sure that your contacts in the phone contain email addresses, otherwise use the “Add friends” option from the side menu. 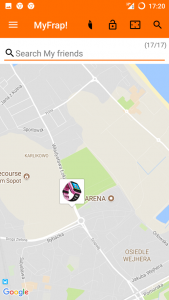 How to change person’s icon on the map? MyFrap! reads people icons from your contacts. To change the contact’s icon on the map, edit the contact by adding a photo to it, then synchronize contacts again. The location of the watch is not accurate, is it a mistake? What is Kid protect module? I already have a watch, can I join MyFrap! network? Fees for using the MyFrap network! Using the MyFrap! network is free, as long as you accept the terms of the service regulations. How to return to SeTracker? Really appreciate for letting us know why you want to back to SeTracker. Such feedback help us improve MyFrap! services. How long the device works without charging? Battery life depends on many factors such as GSM signal strength, pedometer, screen switching frequency, number of voice calls made, frequency of use of the flashlight or pedometer usage. Icon of my watch on the map is crossed out, what does it mean? The crossed out icon means that its location has been calculated on the basis of GSM base stations and may be burdened with a measurement error. Regular icon means that the location comes directly from the GPS it is very accurate. Does MyFrap! work on the iPhone? 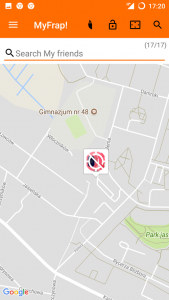 I disabled Location Services, how can I re-enable it?